this is the cover of the fall 2009 issue of distraction magazine- the magazine of the students of the university of miami. 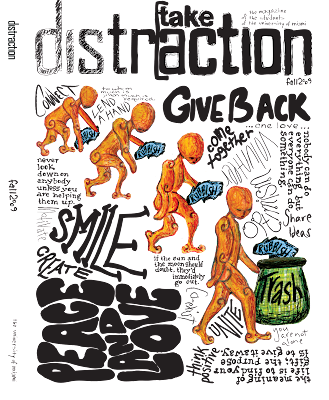 3. a little bit of effort can be all the change we need, and this is depicted through the 'evolution of man' idea picking up a piece of trash and throwing it out. 4. i hand drew the entire cover, using a sketchbook and pens, colored pencils, markers, and the like. i then scanned it in to touch it up on illustrator. this design was inspired by a weekend of "removing myself" of all distractions, and following all my intuitive thoughts. it describes an enlightening moment in my own life, as well as a close friend of mine who experienced the same thing, the same time, on the same days, in the same weekend. unexplainable occurrences explained only by this quote, that i had articulated after it all happened.